Brignel Camilien works at the Arthur Ashe Institute of Urban Health, designing projects that help communities increase awareness of health issues. But his path leading to public health research has been unconventional. Before joining the Institute, he had been a barber at the Skills R Us Barbershop in Brentwood, Long Island. In fact, he was asked to work with the institute for that very reason. Camilien is part of a community outreach effort that the Arthur Ashe Institute runs from the SUNY Downstate Medical Center campus in Brooklyn. On his desk, one might find a thin spiral book with the words “Barber’s Workbook” emblazoned on the cover. These workbooks are some of the remnants of the Barbershop Talks with Brothers program, which ended its data collection phase earlier this year. “When a black man sits down in that chair, he’ll say things he wouldn’t say to other people in his community,” said Dr. Michael Joseph, one of the scientists who organized Barbershop Talk with Brothers. The program, which ran from 2012 to this year, was a joint effort by the Arthur Ashe Institute of Urban Health and SUNY Downstate Medical Center to bring HIV awareness to communities of heterosexual black men in New York City. Hinging on the fact that black heterosexual men are more likely to have a regular barber appointment than to have a regular doctor’s appointment, the researchers developed an intervention based out of barbershops. They began with a steering committee composed of a doctor, barbers, a religious leader, and other community members—a diverse group of people who contributed to the development of the study. Barbers from all over the city were given training sessions at SUNY Downstate’s facilities. This training turned the barbers into health advocates who would be comfortable approaching their clients with advice about sexual health. The barbers then referred their clients to the researchers to attend further classes on HIV/AIDS. 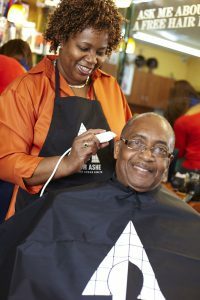 Through their connection with the barbers, the researchers were able to recruit over 1,000 participants to attend their classes. In order to measure improvement, the participants were given a baseline exam on sexual health, attended the class, and were given a second exam six months later. Although the results have not yet been analyzed, pilot studies showed that participants felt far more confident in taking their health into their own hands. They began using condoms more and felt more empowered as a community. This structure of this study—beginning with a steering group composed of local residents and ending with participants taking their knowledge back to others in the community—is quite unique within the field of public health. It’s an example of Community-Based Participatory Research, or CBPR, a method of research that keeps communities involved in every step of the research process. Similar methods of research are prevalent in developing countries, but Community-Based Participatory Research has recently grown more popular in the United States; the Arthur Ashe Institute conducts several such studies, but it’s only one of many similar projects in New York City. With his expertise in geriatric medicine, Reid focuses his research largely on pain management and palliative care. One example of his work is the Arthritis Self-Help Program, which ended in 2008 and sought to enable senior citizens to manage their own pain. Just as the Barbershop Talk with Brothers project did, Reid began with a steering committee consisting of senior center directors and elderly community members as well as pain management experts and doctors. And rather than going through barbershops, the interventions were carried out through senior centers. Approximately 250 senior centers were equipped with programs from the Arthritis Foundation, and the participants were given tests before and after taking part in the programs to determine their pain management. Not surprisingly, the program created by senior citizens for senior citizens proved to increase their pain relief while also giving them a sense of empowerment. Reid’s office is on the 14th floor of the medical center’s campus in Lenox Hill. His office is cluttered with papers and textbooks, but he seems to know where everything is located; reaching behind a cardboard box stacked high with even more papers, he pulls out a textbook written by Dr. Barbara Israel from the University of Michigan School of Public Health. Israel is one of the most prominent researchers of the community-based research method, and has outlined a set of nine tenets that should be at the base of every CBPR study. These principles were described in a 2005 paper in Environmental Health Perspectives and emphasize the importance of keeping community members at an equal level to researchers. “There’s this idea of the researcher as an interloper, only coming to get what they want,” Reid said, “and working in these communities, we heard this time and time again: ‘Researchers would come in, collect information, and we’d never hear from them again, so we don’t even know what happened.’ So that process of remaining engaged and developing a partnership is critical to the process. Although this method of conducting public health research sounds intuitive, there are several reasons it has not become as popular as it should be. The National Institutes of Health is a government agency responsible for biomedical research and research funding, and it has funded the work of both the Arthur Ashe Institute and Reid. According to the agency’s public database, out of the 71,703 projects it funded over the past year, just 472—fewer than 1 percent—were projects of Community-Based Participatory Research. This ratio is reflected in the dollar amount granted to such projects: $287 million out of a $39 billion budget (that’s about 0.7 percent). Community-Based Participatory Research seeks to rewrite the answer to the question: Where does healthcare happen? One way to change the current biomedical mindset is to emphasize the importance of patient involvement early in people’s medical careers. “What’s needed in medical school is cultural competency,” said Dr. Marilyn Fraser-White, the deputy executive director of the Arthur Ashe Institute and an assistant professor at the SUNY Downstate Medical Center. Because the Institute is housed on the SUNY Downstate campus, medical students are given a rare opportunity to get involved with CBPR research. Forming these relationships with patients is at the heart of CBPR, and students who are ingrained with CBPR values are likely to become more compassionate, effective physicians. “Although the project is over, we still get phone calls about the classes. We still visit the barbershops to distribute condoms,” said Camilien, one of the people involved with the Barbershop Talks with Brothers project. Camilien had been a barber interested in medicine when he was recruited to the project during its early stages. Now, he’s developing a new Community-Based Participatory Research project with the Arthur Ashe Institute. “Most people don’t look into the reasons why preventions don’t work; reasons like lack of health insurance, past experiences with doctors or researchers. But when we go to the community, we meet people where they are,” he said.